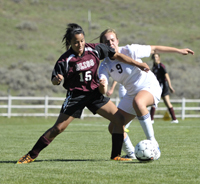 The Community School girls’ soccer team will carry the top seed into the High Desert Soccer Conference tournament starting Saturday, Oct. 11 with three games at SunWay Soccer Complex in Twin Falls. Earning a first-round bye with the top seed, the Cutthroats won’t have to play Saturday as the five-time defending HDSC tournament champions stay home and prepare their title defense. Coach Kelly Feldman’s top-seeded Sun Valley girls will host a second-round game Monday, Oct. 13 at 4:30 p.m. at Sagewillow Farms in Elkhorn against the winner of Saturday’s game between No. 5 Buhl and either Filer/Gooding. Another consequence of earning the top seed is the prospect of the Cutthroats hosting the HDSC tourney championship game Wednesday, Oct. 15 at Sagewillow, with their likely opponent the No. 2 Bliss Bears (8-1-2, 26 points). On Monday, the Cutthroats (9-2-2, 9-0-2, 29 points) clinched the HDSC regular-season title with a 6-0 triumph at Filer (8-6-0, 6-5-0, 18 points). Filer was the Cutthroat opponent in last October’s HDSC tournament finale won by the Cutthroats 6-1 for their fifth straight title. Freshman forward Ella Viesturs (21 goals) recorded her fourth three-goal hat trick in the last six Cutthroat games and earned “Player of the Game” honors. Sophomore Kate Rathfon added two goals and freshman Molly Milgard had one. Senior Sydney Hagenbuch landed an assist. Last Thursday, the Cutthroats battled to their second straight 1-1 league tie, this time against the Bliss Bears at Bliss. A penalty kick by Viesturs was the lone score for the Cutthroats, who edged Bliss 2-1 way back on Sept. 2 on a goal by Viesturs at Sagewillow. “Player of the Game” at Bliss was Ella Pepin.